Birth date and place b. 1823 Clonallen, Warrenpoint, Down, Ireland. Baptism date and place Diocese of Dromore baptisms not extant before 1826. Physical Description Height: 5 ft. 7 ins. Complexion: fresh. Eyes: grey. Hair: light brown. 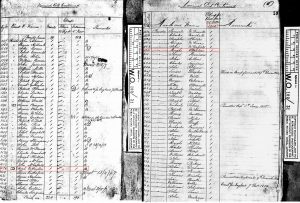 Marriage date and place 1864 Lurgan, Armagh (tentative). 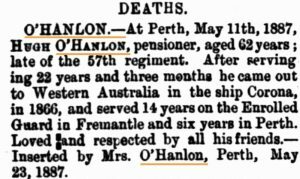 Death date and place 11 May 1887 Perth, Western Australia. Burial date and place May 1887 East Perth Cemetery, Western Australia. Will and Probate Letters of Administration (17 Mar 1888) with Will (6 May 1887). Probate: 19 Mar 1888, Supreme Court of Western Australia. Death Notices and Obituaries Daily News 23 May 1887. Regiment(s) 57th (West Middlesex) Regiment. Regiment No. and Rank #1596 Private. Attestation date and place 4 Oct 1841 Newry, Down. Service/Campaigns East Indies 3 years 9 months. Corfu 1 year 6 months. Courts Martial (various) Confined 25 Aug 1849. Tried 3 Sep 1849 by Regimental Court Martial. Sentenced 35 days Imprisonment with Hard Labor and deprived 1d. a day for 6 months. Imprisoned 3 Sep to 6 Oct 1849. Confined 17 May 1850. Tried 25 May 1850 by Garrison Court Martial. Sentenced 84 days Imprisonment with Hard Labor. Imprisoned 25 May to 15 Aug 1850. Confined 4 Jun 1851. Tried 6 Jun 1851 by Regimental Court Martial. Sentenced 42 days Imprisonment with Hard Labor and deprived 1d. a day for 6 months. Imprisoned 6 Jun to 17 Jul 1851. Confined 7 Oct 1851. Tried 9 Oct 1851 by Regimental Court Martial. Imprisoned 9 Oct to 19 Nov 1851. Confined 14 Jan 1857. 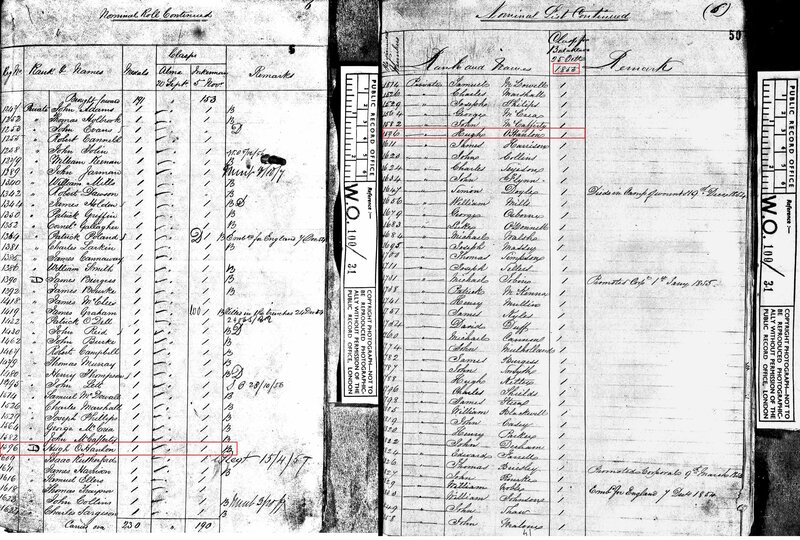 Tried 21 Jan 1857 by District Court Martial. Sentenced 84 days Imprisonment with Hard Labor and deprived 1d. a day for 6 months. Imprisoned 21 Jan to 14 Apr 1857. Entered 25 times in the Regimental Defaulters Book. Discharge date and place 30 May 1865 Cork. Length of Service 22 years 268 days. Pension Amount 1/0½d. per diem. Increased to 1/6½d. per diem on 18 Jan 1881 for service EPF. 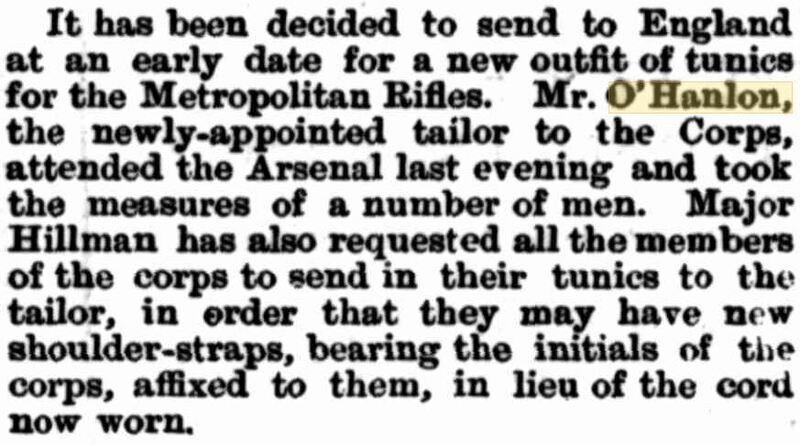 Enrolled Guard from 1 Oct 1881 to disbandment on 31 Mar 1887. 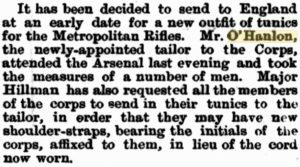 Tailor for Metropolitan Volunteer Rifle Corps 1884 (see sidebar). Land Grant/Purchase 21 Sep 1883 Lot 87 North Fremantle (grant). Misc. Newspaper Articles Daily News 6 Mar 1884. 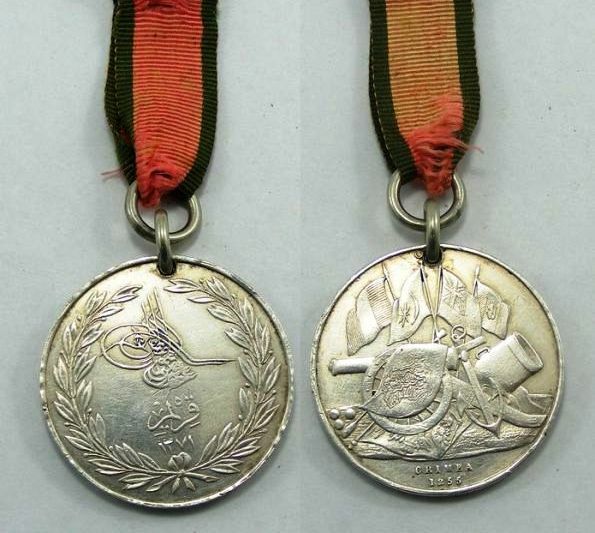 Medal Roll for O’Hanlon’s clasps Balaklava, Inkermann, Sebastopol. Note the clerical error in the year recorded for the Battle of Balaklava. 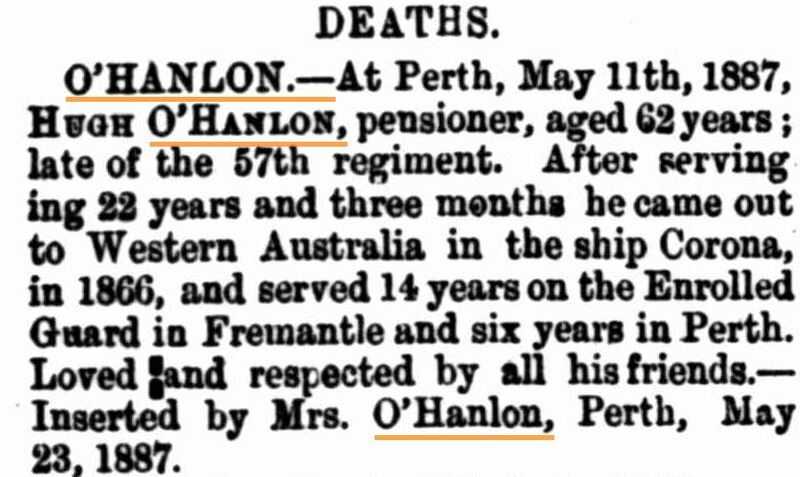 O’Hanlon recorded at the Disbandment of the Enrolled Guard [Inquirer]. Note the incorrect clasp recorded.